There’s a good reason why art is one of the most sacred and celebrated aspects of human civilization. Not only does it provide us with a doorway into the past, but also allows us inside of the minds of the geniuses that create it. When it comes to timeless works of art such as Leonardo da Vinci’s The Last Supper or Michelangelo’s painting in the Sistine Chaple, it’s widely accepted that these are amazing pieces. But sometimes, works such as these have small details that people have looked over for centuries. Take a trip back in time and discover the secrets that can be found in some of history’s most valued works of art. See the message Michaelangelo was sending in his painting in the Sistine Chaple. The Arnolfini Portraited by Jan van Eyck is a painting of Italian merchant Giovanni di Nicolao Arnolfini and his wife. It is celebrated for its impressive use of space, lighting, and the realism in portraying the couple and their surroundings. 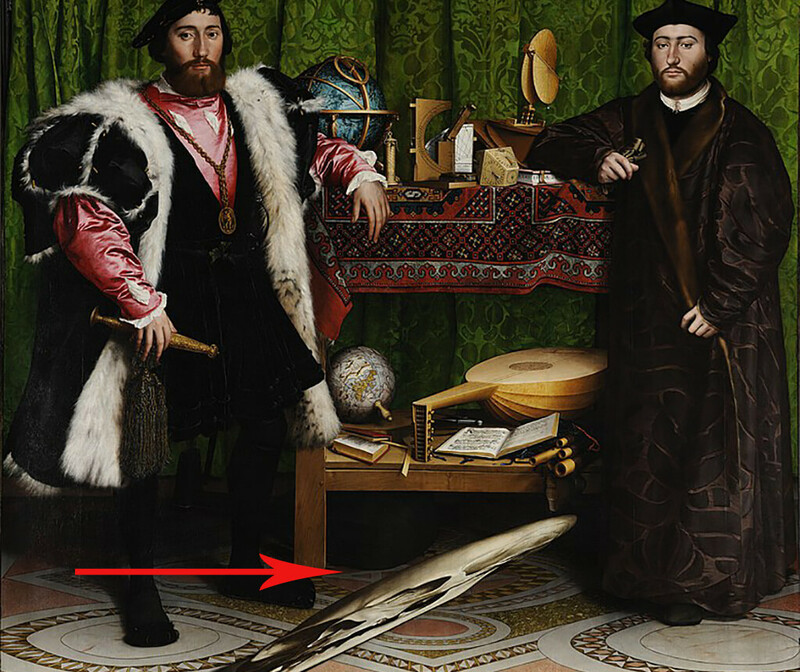 While the painting in itself is impressive, there’s more to the painting than meets the eye. Although people have found symbolism in the various items around the room, one of the most discussed aspects can be found in the reflection in the mirror in the back of the room. If you look closely, you can make out two additional figure standing in the doorway. 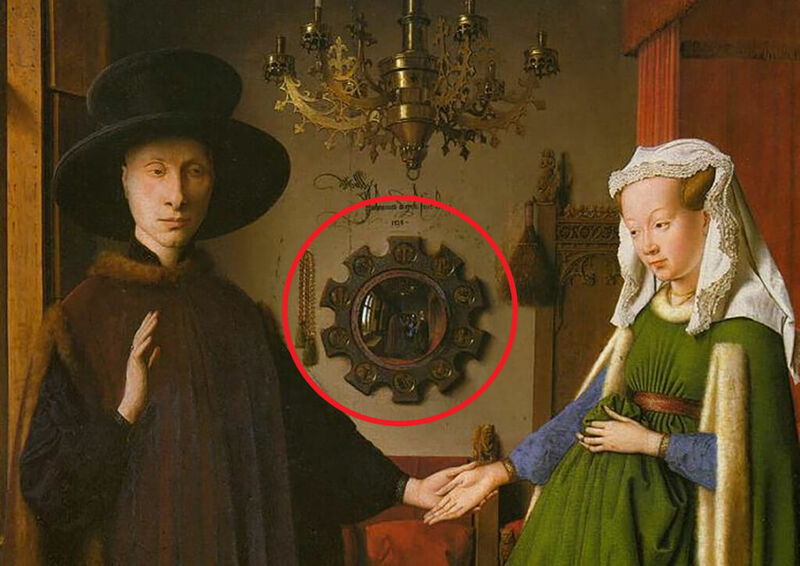 One of them is assumed to be Jan van Eyck himself, immortalizing himself in a portrait of others. 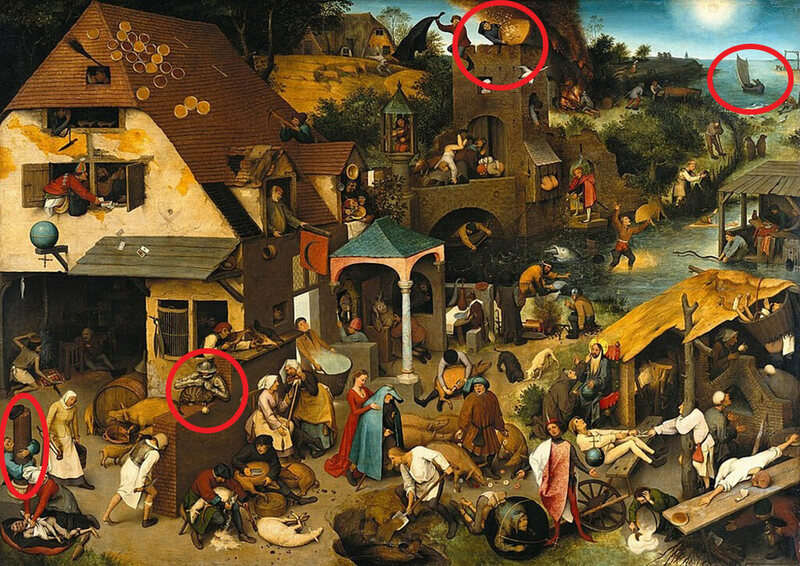 For most people who glance at Netherlandish Proverbs, they may see nothing more than a painting illustrating a bustling street scene in the Netherlands. While many of the actions performed by the subjects in the painting appear odd, that’s because they all have meaning. The 1559 painting depicts 112 identifiable Netherland proverbs and sayings that have been displayed in literal illustration. Some of these include “to be a pillar biter,” “to be armed to the teeth,” “toss feathers into the wind,” “to keep one’s eye on the sail,” along with many others. Bruegel is known for his themes surrounding the absurdity of humans, and this painting demonstrates that. Michaelangelo’s painting of the Sistine Chaple’s ceiling tells the story of Genesis across nine sections. While the painting may seem rather straightforward, it is believed that Michaelangelo left behind a message. Although Michelangelo was an amazing artist, he also devoted time to the study of the human anatomy. He did this to satisfy his own curiosities, as well as to make his art as realistic as possible. 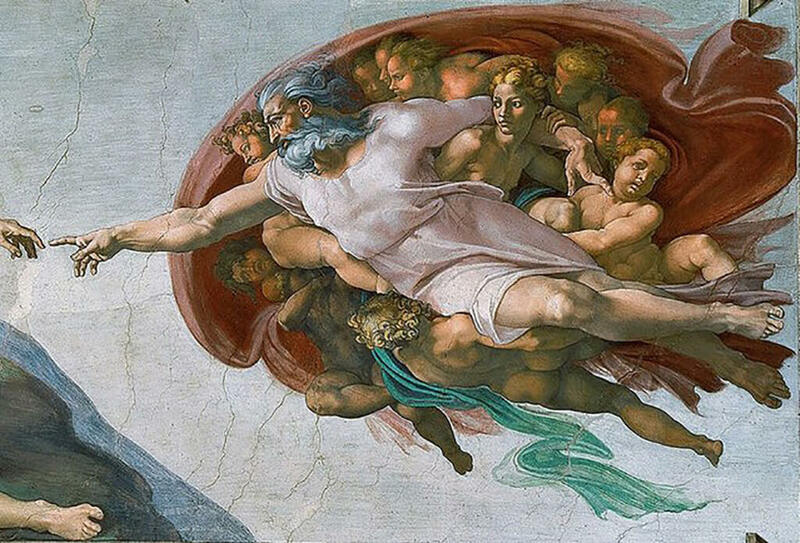 In the section when God is touching fingers with Adam, God appears to be inside what looks like a brain. The cerebrum, optic nerve, pituitary gland, and the vertebral artery can all be deciphered as well. It has been hypothesized that Michaelangelo was sending the message that not only did gid give Adam life, but the ability to reason and think for himself. 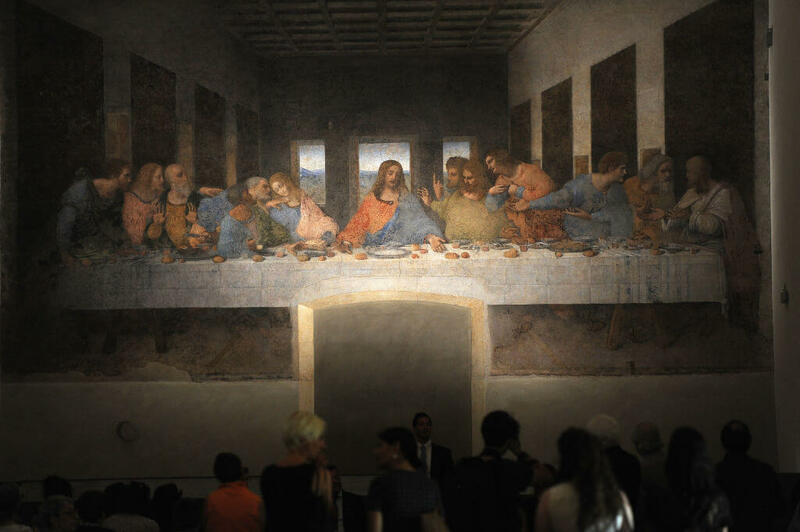 Over the years, the many of the rumors surrounding Leonardo’s painting The Last Supper have been proven false. Especially those spawned from Dan Brown’s novel The Da Vinci Code. However, Leonardo has established himself to be far too genius to leave such a masterpiece behind with nothing else attached. Along with being a scientist, mathematician, inventor, and artist, he was also a musician. Interestingly enough, when a musician took notice of the bread rolls that run across the table, he noticed something. He discovered that if you draw the five lines of a musical staff across the painting, the bread rolls in combination with the apostle’s hands line up to make musical notes. If read from right to left, in Leonardo’s signature style, the notes supposedly make up a 40-second musical composition. The Last Supper isn’t the only painting where musical notes have been discovered. 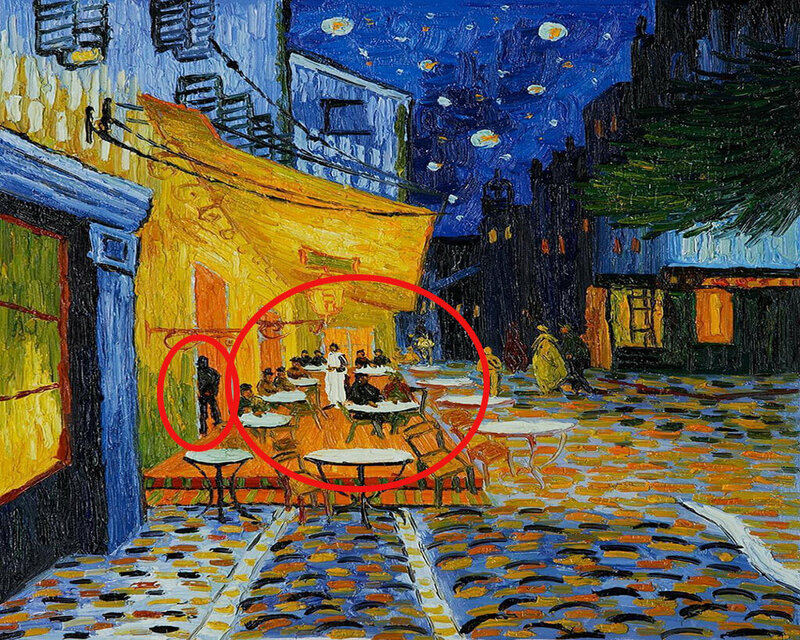 At a glance, Vincent Van Gogh’s Café Terrace at Night might just appear to be the depiction of a typical evening scene in France, done in Van Gogh’s unmistakable style. However, many people see this painting as a twist on Leonardo da Vinci’s The Last Supper. Being the son of a Protestant minister, Van Gogh was religious himself. Much like Leonardo’s painting, Café Terrace at Night features 12 people sitting together, with the central figure wearing all white, having long hair, and standing before the rest, representing Christ. The dark figure in the doorway can also be assumed to be Judas. Although this may be a stretch to some, there is also a lot of crucifix imagery, including the one directly above the supposed Christ figures head in the window. 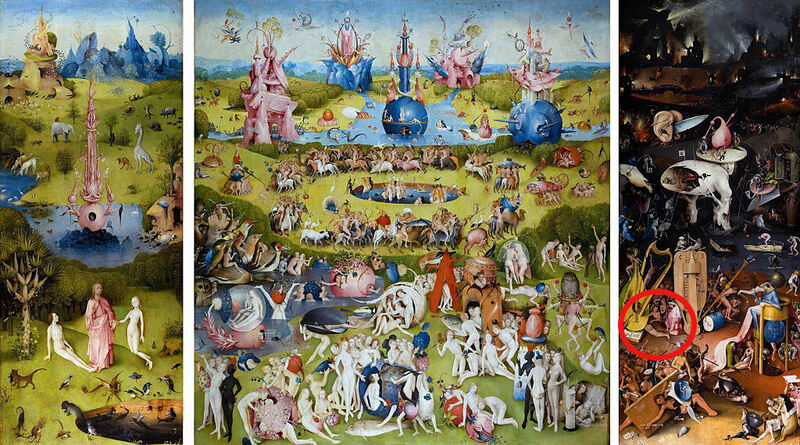 The Garden of Earthly Delights, is a triptych oil painting that reads left to right that is full of thought-provoking themes surrounding history, faith, and the human condition. Bosch is a master of detail and making the viewer feel however he wants them to whether it be peaceful and calm or horrified and distressed. The Garden of Earthly Delights has no shortage of either. The statue of David cleverly shows multiple sides of the biblical figure. Initially, Nelson Rockefeller commissioned Diego Rivera to paint Man at the Crossroads for the Rockefeller Center in New York. However, he didn’t appreciate the depiction of communist revolutionary Vladimir Lenin and had the painting destroyed. In response, Rivera repainted the mural in Mexico City and renamed it Man, the Center of the Universe. However, when he repainted it, he added a depiction of Nelson Rockefeller’s father under the bacterial imagery of syphilis. Rivera had secretly told the world in his painting that Nelson’s father had syphilis. To make it even clearer, he depicted him holding a martini standing next to a woman that could very well be a prostitute. 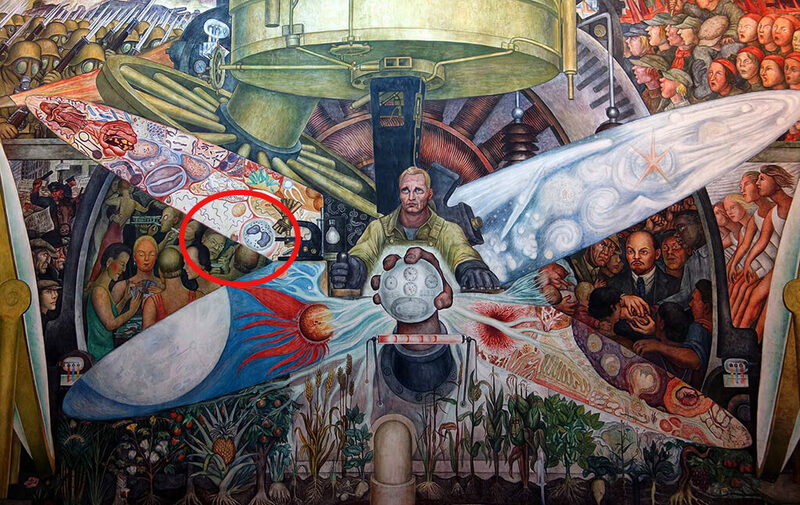 Furthermore, Vladimir Lenin is even more prominent in the second mural that Rivera created. No matter how confident, healthy, or prosperous these two gentlemen are, death is always going to be attached to them and following them wherever they go. The painting was designed to be hung on a stairwell so that those passing by would be able to easily see the skull and be reminded of their ever-impending death. Michaelangelo’s 17-foot-tall statue David is considered to be one of the most impressive sculptures of all time. Because the statue is so tall, people only see the David from below, in which he seems calm, looking forward with confidence. However, when you look at his face from eye level, his expression is something entirely different. His facial expression appears to be angry or even scared. When you consider the story what the sculpture is portraying, it makes sense. The statue is supposed to illustrate the moments before David is about to go and fight Goliath, one of the greatest showdowns in history. However, unless you’re face to face with David, you wouldn’t be able to see his real emotions. While The Independent describes the Mona Lisa is “the best known, the most visited, the most written about, the most sung about, the most parodied work of art in the world,” there are great mysteries behind it. Whether Mona Lisa’s ambiguous smile, the painting’s composition, or the background, people continue to study the artwork today. 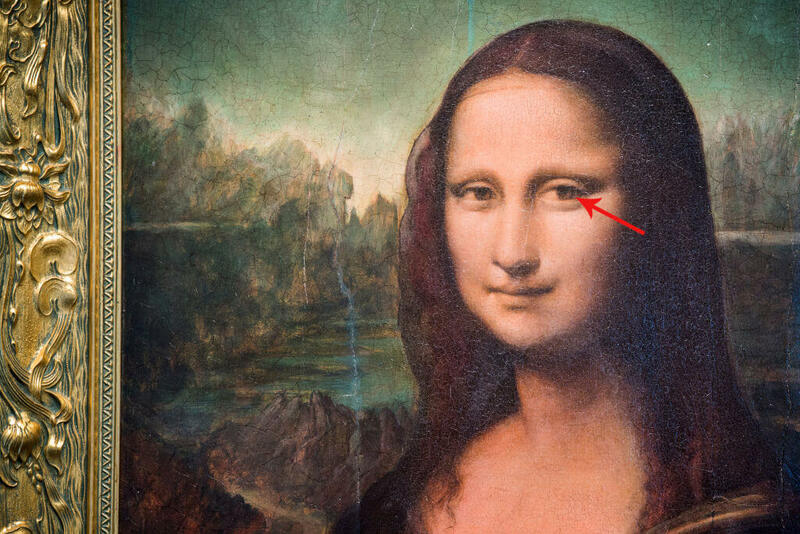 It was discovered that Leonardo left his initials “LV” in her right eye, although they are microscopically small. This too has raised questions. However, in 2015, a French scientist discovered using reflective light technology that there was another portrait of a woman underneath the painting we see today. It is believed that was Leonardo’s first draft before he created the most famous work of art of all time.